← What a Great Year on Camano Island! 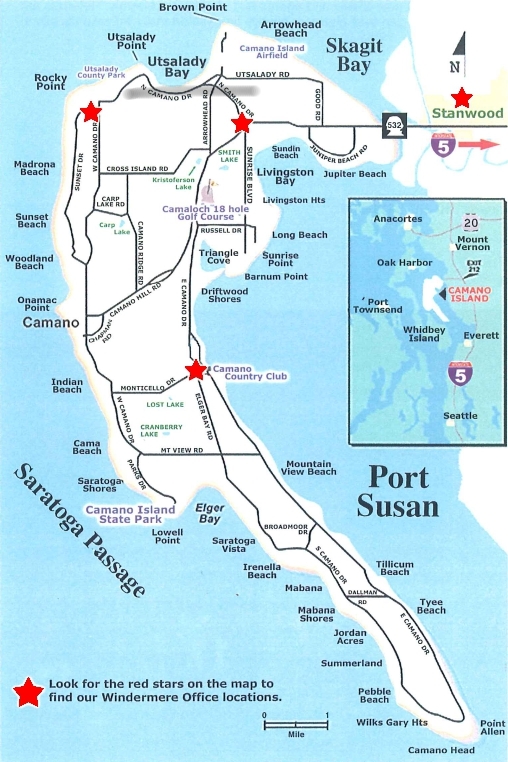 Tucked away between Whidbey Island and the mainland, some people may not know much about Camano so this post is dedicated to ‘putting it on the map.’ Speaking of which, if you click on the map below, it will pull up a larger image. Camano Island is just a hop and a skip up I-5, only 55 miles north of downtown Seattle on Highway 532. It is 20 miles north of Everett and 2 miles west of Stanwood. Camano is located in Island County in the Olympic rain shadow and receives less rain than neighboring areas – only 17 to 20 inches annually. The east side of Camano features panoramic views of Mt. Baker, Mt. Rainier, the Cascade Mountains and quiet Port Susan. The west side features unparalleled sunsets and boat traffic through Saratoga Passage to La Conner and the San Juan Islands. Boating, salmon fishing, clamming and crabbing are bountiful on Camano. A beautiful State Park and County Park are available to all. Common outdoor activities include sailing, hiking, water skiing, beach-walking and water sports and a challenging 18-hole golf course is available to all “aspiring duffers.” Bald eagles, blue herons, snow geese and other wildlife are prevalent. Quality of life is the main attraction to Camano, with large evergreens creating a magical setting only seen on Camano. Island County has the second lowest crime rate in Washington. Ranging from less than 1 mile to more than 7 miles in width and almost 20 miles in length, Camano Island boasts 56 miles of shoreline. The topography is punctuated by low hills in central Camano and altitudes range from sea level to 540 feet. Now that you have some of the details, are you ready for a more personal tour to look at available property? Call me today! Jan Mather, Camano Island Expert: 360-507-4133.